Heat oil & once hot add onion, garlic & bacon or chicken (optional). Once cooked add Life’s Good Red Curry Paste & fry until fragrant. 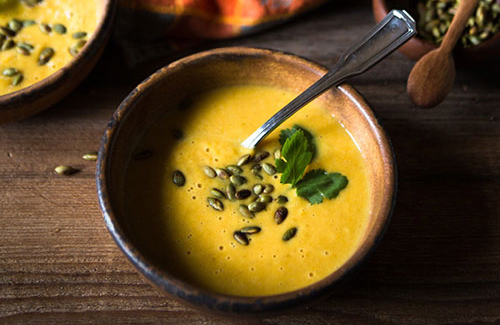 Stir in roasted pumpkin cubes, ginger, nutmeg, stock & coconut milk & simmer for 1 hour. Carefully puree hot soup with a stick blender or just lightly mash pumpkin cubes depending on your taste. Garnish with fresh coriander and cracked pepper and serve with warm crusty bread or hot toast. TIP! This recipe is also fantastic using fresh scallops and prawns instead of bacon and chicken. Gently poach scallops and prawns in finished soup for approx 7 or 8 minutes until just cooked through. Serve immediately.